Goran Dragic scores 26 points as the Heat defeat the Thunder 116-107. Appeared in 75 games (six starts) for the Boston Celtics and averaged 9.0 points (.512 FG%, .732 FT%), 4.8 rebounds, 2.0 assists and 20.5 minutes…missed a total of seven games due to injury…missed the first six games of the season (Oct. 26-Nov. 6) recovering from offseason shoulder surgery…sat out one game (Feb. 1) due to a sore left shoulder…set his single-season career highs in games played, minutes, field goals made, field goal percentage, defensive rebounds and assists…topped the Celtics in rebounds 16 times and in assists once…scored in double figures 33 times, including one 20-point outing…grabbed double-figure rebounds three times and posted a pair of double-doubles…scored his 2,000th career point on Nov. 16 vs. Dallas…grabbed his 1,000th career rebound on Dec. 2 vs. Sacramento…Season Highs: 26 points (at Atlanta, Jan. 13), 11 rebounds (twice), six assists (at Charlotte, Apr. 12), three steals (five times), two blocks (nine times) and 35:56 minutes (at Milwaukee, Jan. 28). Appeared in 69 games (eight starts) for the Celtics and averaged 10.0 points (.455 FG%, .750 FT%), 4.1 rebounds, 1.5 assists and 20.2 minutes…missed 12 games (Feb. 19-Mar. 15) due to a right shoulder sprain and one game (Oct. 28 vs. Philadelphia) due to an NBA-imposed suspension…set single-season career highs in points scored, field goal attempts, three-point field goals made and attempted and three-point field goal percentage…led the Celtics in three-point field goal percentage…topped the team in scoring six times, in rebounds five times, in blocks 10 times and in steals on eight occasions…scored in double figures 31 times, including six games with at least 20 points…grabbed double-figure rebounds twice and recorded one double-double…hit a career-high five three-point field goals at Dallas on Jan. 18…logged his 3,000th career minute on Nov. 20 vs. Brooklyn…Season Highs: 28 points (vs. Golden State, Dec. 11), 11 rebounds (vs. Charlotte, Apr. 11), five assists (vs. Brooklyn, Nov. 20), four steals (vs. Washington, Nov. 6), three blocks (at Memphis, Jan. 10) and 37:07 minutes (vs. Golden State, Dec. 11). Saw action in 64 games (13 starts) for the Celtics and averaged 10.3 points (.475 FG%, .684 FT%), 4.7 rebounds, 1.7 assists, 1.00 steals and 22.3 minutes…missed 18 games due to a sprained right ankle (Jan. 23-Mar. 15)…set single-season career highs in starts, scoring average, free throws attempted, steals and blocked shots…topped the Celtics in points seven times, in rebounds eight times, in blocks 23 times, in steals on 12 occasions and in minutes and assists once each…scored in double figures a single-season career-high 35 times, including six games with at least 20 points and his lone 30-point effort…grabbed double-figure rebounds on three occasions and posted three double-doubles…scored his 1,000th career point on Jan. 14 vs. Atlanta…recorded career highs in points (30) and field goals made (12) at Philadelphia on Dec. 15…grabbed a career-high 13 rebounds vs. Toronto on Nov. 5…matched his career high with seven assists at Atlanta on Dec. 2…was selected to the World Team for the Rising Stars Challenge at All-Star Weekend but was unable to play due to injury…Season Highs: 30 points (at Philadelphia, Dec. 15), 13 rebounds (vs. Toronto, Nov. 5), seven assists (at Atlanta, Dec. 2), four steals (at Washington, Dec. 8), three blocks (vs. Detroit, Dec. 3) and 41:27 minutes (at Washington, Dec. 8). Appeared in 70 games (nine starts) for the Celtics and averaged 8.7 points (.466 FG%, .811 FT%), 5.2 rebounds, 1.6 assists and 20 minutes…missed a total of 12 games due to injury…missed 10 games due to a sprained right ankle (Nov. 23-Dec. 11)…sat out a pair of games (Feb. 23 and Mar. 14) due to a sprained left big toe…was named to the NBA All-Rookie Second Team…ranked among the NBA rookie leaders in field goal percentage (2nd), rebounds per game (2nd), free throw percentage (4th), scoring average (6th), minutes per game (10th) and assists per game (13th)…set single-season career highs in free throws made, free throw percentage and offensive and total rebounds…finished third on the team in offensive rebounds…topped the Celtics in scoring nine times, in rebounds 12 times, in blocks eight times, in steals on five occasions and in assists twice…scored in double figures 22 times, including six games with at least 20 points…scored at least 20 points in a career-high three consecutive games from Apr. 12-16…grabbed double-figure rebounds a career-high five times and amassed three double-doubles…handed out a career-high seven assists vs. the Lakers on Jan. 17…made his NBA debut in his birthplace of Toronto on Oct. 30 and tallied four points in 16:18 of action…made his first career start at Miami on Nov. 9 and finished with seven points, eight rebounds, four assists and one block in 22:45 of action…started for Team Webber in the Rising Stars Challenge at All-Star Weekend in New Orleans and tallied nine points, three steals, two assists, one rebound and one assist in 25:27 of action…Season Highs: 28 points (at Philadelphia, Apr. 14), 12 rebounds (at Cleveland, Apr. 12), seven assists (vs. L.A. Lakers, Jan. 17), three steals (twice), two blocks (six times) and 38:52 minutes (at Cleveland, Apr. 12). 2014-15: Was selected to the World Team for the Rising Stars Challenge at All-Star Weekend…2013-14: Was named to the NBA All-Rookie Second Team…was a starter for Team Webber in the Rising Stars Challenge at All-Star Weekend. Senior National Team: Helped lead Canada to the bronze medal at the 2015 FIBA AmeriCup, appearing in 10 games and averaging 11.9 points (.553 FG%, .833 FT%), 7.5 rebounds, 2.3 assists and 21.6 minutes…was part of Canada’s gold medal winning team in the Tuto Marchand Continental Cup, totaling eight points, three rebounds, one assist, one steal and one block in 15 minutes in his one appearance…appeared in eight games in the 2011 FIBA AmeriCup, averaging 6.9 points (.383 FG%, .842 FT%), 3.8 rebounds and 14.3 minutes while helping Canada to a sixth-place finish…saw action in four games in the 2010 FIBA World Cup and averaged 8.2 points (.556 FG%, .846 FT%), 2.8 rebounds and 15.8 minutes…Junior National Team: Participated in eight games in the 2009 U19 World Championship and averaged 12.1 points (.373 FG%, .760 FT%), 8.3 rebounds, 1.6 assists and 27 minutes as Canada finished in seventh place…helped lead Canada to the bronze medal at the 2008 U18 Americas Championship, appearing in five games and averaging 1.8 points (.214 FG%, 1.000 FT%), 3.2 rebounds and 13.6 minutes. INTERNATIONAL: Senior National Team: Helped lead Canada to the bronze medal at the 2015 FIBA AmeriCup, appearing in 10 games and averaging 11.9 points (.553 FG%, .833 FT%), 7.5 rebounds, 2.3 assists and 21.6 minutes…was part of Canada’s gold medal winning team in the Tuto Marchand Continental Cup, totaling eight points, three rebounds, one assist, one steal and one block in 15 minutes in his one appearance…appeared in eight games in the 2011 FIBA AmeriCup, averaging 6.9 points (.383 FG%, .842 FT%), 3.8 rebounds and 14.3 minutes while helping Canada to a sixth-place finish…saw action in four games in the 2010 FIBA World Cup and averaged 8.2 points (.556 FG%, .846 FT%), 2.8 rebounds and 15.8 minutes…Junior National Team: Participated in eight games in the 2009 U19 World Championship and averaged 12.1 points (.373 FG%, .760 FT%), 8.3 rebounds, 1.6 assists and 27 minutes as Canada finished in seventh place…helped lead Canada to the bronze medal at the 2008 U18 Americas Championship, appearing in five games and averaging 1.8 points (.214 FG%, 1.000 FT%), 3.2 rebounds and 13.6 minutes. COLLEGE CAREEER: Played three seasons at Gonzaga before becoming an early entry candidate for the 2013 NBA Draft…appeared in 101 games (32 starts) for the Bulldogs and averaged 8.9 points (.594 FG%, .709 FT%), 4.6 rebounds, 1.1 assists and 17.2 minutes…was a consensus All-American, West Coast Conference Player of the Year, First Team All-WCC and a WCC All-Tournament Team selection as a redshirt junior in 2012-13…appeared in 32 games (28 starts) his junior season and averaged 17.8 points (.629 FG%, .776 FT), 7.3 rebounds, 1.7 assists and 26.4 minutes while leading Gonzaga to a 32-3 overall record, a 16-0 WCC mark, the WCC Tournament championship and a top seed in the NCAA Tournament…was a also a top-five finalist for the John R. Wooden Award honoring the top player in the nation…tallied a career-high 33 points (12-15 FGs, 8-9 FTs) and 10 rebounds at Santa Clara on Jan. 5, 2013…sat out the 2011-12 season as a redshirt…appeared in all 35 games (four starts) for the Bulldogs as a sophomore in 2010-11 and averaged 5.8 points (.574 FG%, .618 FT%), 3.8 rebounds and 13.5 minutes…came off the bench in all 35 games for Gonzaga as a freshman in 2009-10 and averaged 3.8 points (.500 FG%, .596 FT%), 2.7 rebounds and 12.3 minutes. 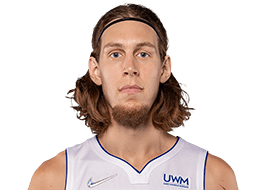 Full name is Kelly Tyler Corness Olynyk…his nickname is “KO”…is the son of Ken and Arlene Olynyk…has two sisters (Jesse and Maya)…his father, Ken, spent 25 years coaching University basketball in Canada including a stint as the head men’s basketball coach at the University of Toronto (1989-2002)…his father also served as coach of the Canadian Junior Men’s National Team (1983-96) and spent one season as a scout and observing coach with the Toronto Raptors…his mother, Arlene, was a Canadian Interuniversity Sport (CIS) women’s basketball referee and worked for the Raptors from 1995 to 2004 where one of her jobs was serving as the official scorer…his sister, Jesse, played rugby at the University of Victoria and his sister, Maya, plays basketball at the University of Saskatchewan…his cousins, Riley Nash and Brendon Nash, are professional hockey players, Riley as a member of the Columbus Blue Jackets and formerly of the Boston Bruins and Carolina Hurricanes and Brendon currently with the Graz 99ers of the Austrian Hockey League after a brief stint with the Montreal Canadiens…his cousin, Brent Olynyk, is a professional badminton player who captured a gold medal in men’s doubles and a silver medal in mixed doubles at the 1999 Pan American Games and represented Canada at the 2000 Summer Olympics…graduated from Gonzaga with a 3.53 GPA in accounting…was named to the Capital One All-Academic First Team and the Division 1-AAA Athletic Directors Association Scholar-Athlete of the Year during the 2012-13 season…is a member of the Board of Ambassadors for Shooting Touch, an international sport-for-development organization which uses the power of basketball to educate and empower at-risk youth and communities…based in Boston and Rwanda, the mission of Shooting Touch is to create a world where every girl and boy live a healthier and longer life free from disease…served as a coach at the 10th Basketball Without Borders Asia Camp in India in 2018, previously was involved with Basketball Without Borders as camper for a BWB camp in Mexico City when he was 18…he has hosted the premier basketball camp in Kamloops each of the past six summers…enjoys all sports but his favorite sport other than basketball is badminton…was named Basketball BC Outstanding High School Player of the Year as a senior while leading South Kamloops to a 36-2 record and a third-place finish at the BC AAA High School Boys’ Basketball Championships…in addition to playing basketball in high school he also played football and rugby…broke his arm near his shoulder joint while playing quarterback in high school in a 2007 playoff game…was born in Scarborough, Ontario and moved to Kamloops, British Columbia when he was in seventh grade…says something most people don’t know about him is that he graduated from elementary school twice…cut his hair following the 2017-18 season and donated it to Wigs for Kids, a non-profit organization which creates wigs for kids for children who have lost their hair either permanently or temporarily due to a medical condition…wears size 15 sneakers.